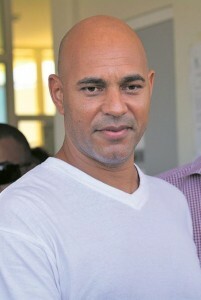 WILLEMSTAD – Today it's Burney ‘Nini’ Fonseca’s turn to prove that he is not the intermediary person between the executors of the murder of the politician Helmin Wiels and the intellectual authors. Lawyer Marije Vaders will plead for her client today. In August 2014, the Public Prosecutor did not have a strong case against him. He was released pending the investigation. Now, almost three years later, there is a lot of evidence connecting him to the murder. Prosecutor Gert Rip says he hopes Fonseca will speak the truth just like Elvis ‘Monster’ Kuwas did in court last Wednesday. Kuwas was present in court on that day under heavy surveillance by four heavy-duty detectives. He was dressed in a grey jogging pants and white T-shirt, including a bulletproof vest. All this protection for the fear that he will suffer the same fate as the other executor of the job, Raul ‘Bolle’ Martinez, who was murdered right after the assassination of Helmin Wiels. This case has the entire community in its grip and many are hoping that the truth will come out soon. According to the Prosecutors, the first phase was to find the executors of the murder, the second phase is what is currently taking place, the case against the intermediary which, according to them, is Burney ‘Nini’ Fonseca. The third phase is bringing justice to the intellectual authors of the murder, those who paid to have the popular politician murdered. Two names were mentioned as the possible authors, but, according to many, there are more. These two names are former Minister of Finance during Government Schotte, Goerge Jamaloodin, and his half-brother, lottery boss Robbie dos Santos, owner of Robbie’s Lottery.